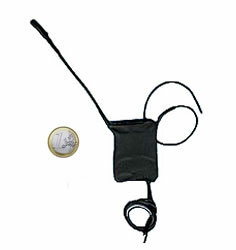 Multifunction surveillance and telephone micro transmitter. Clearly intercepts the voices of both parties when the telephone line is occupied. Operates as a normal surveillance transmitter if the handset is on the cradle. Reduced dimensions. Exceptional audio performance. Amplification control. Microphone cable length on request. A distance of more than 600 meters can be reached in an open field thanks to the power output. The performance obviously depends upon the environmental conditions and the sensitivity of the receiver utilized. To obtain maximum performance, it is advisable to utilize our receivers.